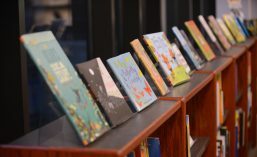 Welcome to the online presence of the Butler Children's Literature Center, housed in Dominican's SOIS and generously supported by the Butler Family Foundation. Here, we run Butler Book Banter (B3), a book discussion group; host an annual lecture; and invite anyone interested in books for youth to visit us during our open hours (Spring 2019 hours: Monday through Thursday 1-6 p.m.) or contact us for an appointment. After a great group discussion on our featured Mock CaldeNott books for the February B3, we are already preparing for our upcoming March B3. It’s right around the corner on March 1st and we will be exploring gender identity. All of the books we are recommending were either featured on the 2017 Rainbow Book List or are part of our 2017 collection. You can also check out a couple of our past blog posts featuring Newsprints and If I Was Your Girl. Join us in the Butler Center on Wednesday, March 1st from 5:30 – 7:00 p.m. (books and snacks out at 5:30 p.m., discussion at 6pm). We look forward to seeing you in March! This entry was posted in Bloomsbury, Candlewick, Macmillan, Scholastic, Uncategorized. Bookmark the permalink. Carmen Agra Deedy–Save the Date! Maybe Today or Maybe Tomorrow: A Review of Maybe Tomorrow?